Excerpt from 'City of Ely March’ from The Fenlands by Arthur Wills performed on the organ of St Andrew’s Episcopal Church, Pittsburgh, PA.
Alastair’s career as an organist has taken him throughout the UK and North America. In 1990, he premiered his first published organ work at the retirement concert of Dr. Arthur Wills, OBE, in Ely Cathedral. In 1991, he won the first ever organ scholarship to Loretto School, Edinburgh, UK, where he played the newly-build Kenneth Jones instrument. During his time in London, he gave recitals throughout the city. Highlights were concerts in St. Paul’s Cathedral where he performed The Fenlands Suite by Dr. Arthur Wills, and in Westminster Abbey where he co-performed Kenneth Leighton’s organ duet Martyrs. In London, he had weekly lessons on the Harrison organ at the Temple Church, and won a prize in organ performance from the Royal College of Music. 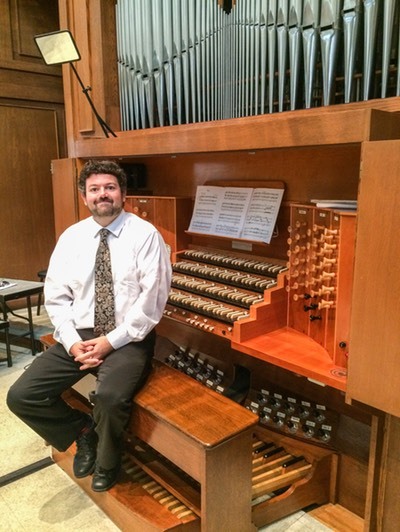 More recently, Alastair has been performing throughout North America in venues such as St. Thomas, Fifth Avenue, New York City, and Trinity Cathedral, and Heinz Memorial Chapel, Pittsburgh, PA. In 2007, he was invited to give the first ever contemporary music recital at the Morelia International Organ Festival in Mexico. His concert was hailed as one of the highlights of the 41st festival. He is a keen advocate of commissioning new music for the organ and has premiered new music written for him by Gordon Lawson, Arthur Wills, Stephen Wilcox and Roger Zahab. He also gives presentations on organ repertoire.